Mobile phony savvy fans won't have to wait too long to play as Zero in Rockman X4 mobile. According to our friend overseas, CapKobun, Zero version will blast its way onto the Capcom Party service on January 5th, 2012. For those not in the know, Capcom will be porting Rockman X4 to mobile phones, splitting the game in two parts. Rockman X's storyline (X Version) debuted earlier today, which also comes with an all-new network based ranking mode. X4 mobile is being being touted as Capcom's highest quality cellphone game yet, with authentic gameplay and sound. I've little doubt the sound will be top-notch, but gameplay? I dunno. Those screenshots have me wincing. I think "Rockman X4: Claustrophobic Version" is a more suitable name for this particular product. I'd feel better if I saw X4 coming to the PSN, but I guess this is a start. Normally I can adjust to screen cropping for the sake of portability without much trouble, but I imagine Jet Stingray's stage is going to be hell. Corrupted definitely looks like a quality fan game. 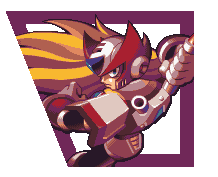 Though...it looks a bit unbalanced between how strong X and Zero are. Zero looks like he can just mop the floor with his arsenal, while X has to strategically use sometimes very gimmicky weapons to get his kills. I look forward to trying it out...if it ever gets a release. Really, Crapcom? Releasing classic MegaMan games on the mobile phone? Nintendo and other gaming companies are dancing on its grave. At least my favorite gaming companies are releasing really good games. Also, STHU when I mentioned them. I bet anyone in this blog know in their hearts that other gaming companies are WAY better than Crapcom. MegaMan isn't your life. And no, I'm not trolling, just stating the facts. Capcom's been releasing Megaman/Rockman games on mobile phones for years now, dude. This isn't something new. You kind of are trolling, you're going around like an annoying Christian witness, trying to "spread some sort of message" and annoying everyone who reads it. We get it, you've got a major hard-on for Nintendo now. What's next, Konami? If anything, Capcom's been at it's best in terms of financial state and profits. It just happens to not be making any new MegaMan games. Honestly, my only complaint regarding this particular mobile port is that it's not on iOS. Which is practically what a few people even on Japanese Rockman forums are saying as well. Nearly all their games for mobile phones are being put on iOS, no matter how big or small, and yet these nicer Rockman games are being released on services that are supported much less than they were in the past. Sure, I would probably just end up downloading it via Installous... but even so, it'd garner a much better sale than what it has now. Sonic's fanbase is (mostly?) horrible, yet SEGA continues to make Sonic games. We DID listen to you (if that's what you're whining about). We got tired of you shilling Nintendo (good company in its own right, but still).